The chances are that you don’t often think about your batch processing. Your schedules have been settled for years; occasionally altered, never rebuilt. Batch streams continue without much intervention, and in many cases few know why some jobs run. The chances are that you only think about batch when there’s a problem: a job abends, a schedule over-runs into an online window, or output isn’t received on time. But it’s no secret that batch is critical for most z/OS systems. From backups and log management to statements and output; from processing bulk data from other systems and organisations to data management and mining. Batch processing and schedules remain a quiet, but important part of your processing. By now automated batch scheduling products such as Tivoli Workload Scheduler, CA-7, BMC Control-M and ASG Zeke have become the norm, taking a lot of the hard work out of batch scheduling and management. But what other software products can help with batch? One of the big features of z/OS is its sophisticated batch functions. Automated job scheduling software can automate the complicated schedules that can come from this sophistication, and it’s easy for these to get out of hand. Sites with daily batch schedules comprising of hundreds of jobs are not uncommon. Most automated batch schedulers include features to view and manage these schedules. However some software vendors have decided that these aren’t enough, and provided additional features including graphical representation of batch schedules. These include APS Advisor, ASG-APC Batchmap, ASG-Workload Planner, Software Engineering of America VisiTrac, HORIZONT TWS/Graph, APS Visualjob and APS TWSemon. Controlling batch is another issue. Do you allow SAS to run on all LPARs, or just a few? Who can submit jobs to each LPAR? MVS Solutions ThruPut Manager helps here. In an ideal world, your batch always works. Unfortunately, we don’t live there. So from time to time, batch jobs fail: a space abend, an application failure, a loop, or an operational issue. And when this happens the question is “where do we restart the job?”. At the beginning, from the failed step, or not at all? If restarting from within the job, there’s a lot of work deciding the appropriate step (some will rely on datasets or processing from previous steps), cleaning up after the failed step, and preparing for the run. Products such as CA Workload Automation Restart Option (CA-11), ASG-Zebb, and Control-M/Restart have been automating much of this manual work for years. Tivoli Workload Scheduler includes similar functionality in the base product. Batch restart becomes even more complicated with jobs that work with databases. For many years IMS Batch Backout Manager has allowed failing IMS batch jobs to backout batch database updates. Several products go one step better, allowing batch to restart at the last successful IMS checkpoint. These include BMC Application Restart Control for IMS, CA Mainframe Restart Manager for IMS and IBM IMS Program Restart Facility. DB2 doesn’t miss out with BMC Application Restart Control for DB2 and Softbase Checkpointing Facility. Some products extend this idea to VSAM, including BMC Application Restart Control for VSAM. And Relational Architects’ Smart/Restart covers multiple RRS activity including IMS, DB2 and Websphere MQ. When your overnight batch schedule starts impacting your online processing during the day, or reports and data transfers don’t meet SLAs, batch performance becomes very important. We take a closer look at batch tuning in our article Why Your Batch is Running Slow. However there are some products that can speed up your batch. Dataset buffering software such as CA Hiper-Buf, Serena StarTool IOO, Rocket Performance Essential, and Dino VELOCI-RAPTOR batch can dynamically improve your VSAM and QSAM buffering without application or JCL changes, potentially removing large chunks from your batch processing time. Other software such as Macro4 VSAMTune and Software Engineering of America SmartProduction can analyse VSAM performance and recommend changes. Not exactly a software product, but Critical Path Software provides services and software to analyse dataset performance for entire systems, recommending JCL and definition changes to speed them up. DB2 performance can severely impact batch. Other than standard DB2 tuning tools, there are performance tools aimed directly at DB2 batch. These include SoftBase Batch Analyzer Facility. CA-IDMS users also have options such as ARCH Consulting BATSTAT and Hybrid Systems DBSTATS. Sometimes batch jobs can wait for DFHSM dataset recalls. A batch job requiring tens of dataset recalls from tape can potentially wait for some time. Some software products can recall these datasets before a batch job executes – saving this time. Examples include DTS MON_PRECALL and OpenTech HSM/Advanced Recall. Some software products combine some of the above features, and provide additional performance analysis and improvement functions. These include Software Engineering of America SmartProduction, BMC MainView Batch Optimizer, and Trident z/OSEM. We all hate production batch that stops from JCL errors. Or space errors. Or RACF security errors. 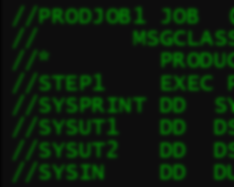 Fortunately, JCL scan software can check the JCL syntax, confirm that datasets exist, and that all the necessary RACF or security rules are in place – all before the job is submitted. Many will slip seamlessly into your batch automation product, performing automatic JCL scans when schedules are prepared. Some can also be used to enforce JCL coding standards. Examples include ASG Job/Scan, ASG JCLPREP, CA JCL Check, and E-GEN JCLChecker. Output produced by batch can be critical. Software to verify the validity of this output can be invaluable. Examples include BMC Control/M Analyzer, ACR/Detail, ASG ViewDirect/ABS and Beta 91 Automated Balancing and Quality Manager. Aside from the normal batch automation software, there are lots of options to improve batch schedule management, control, reliability and performance. The software here is just the start. Lookup Mainframe Software is a great place to start investigating the options.